An astronomical high tide in Portland reached 13.1 feet, the 12th highest ever for the city, CBS 13 Chief Meteorologist Charlie Lopresti reported March 2, 2018. Flooding caused by rising sea levels threatens property values in Maine and New England, with $69.9 million lost in Maine and $403 million lost across the region, a study released Tuesday found. The report found dramatic dropoffs in home values from Kittery to Winter Harbor, with the most severely affected community being Bath, where researchers found two homes that should be worth nearly $150,000 apiece now valued at just more than $90,000 because of the higher water. The lost home values were recorded between 2005 and 2017 in a study by Columbia University and First Street Foundation, a Brooklyn, New York-based nonprofit that studies sea level rise and its effects. The two collaborated to compile the data from the U.S. Geological Survey, the National Oceanic and Atmospheric Association and the U.S. Army Corps of Engineers as well as data on homes sold and how many bathrooms and bedrooms they had. “Increased tidal flooding leads to a loss in home value appreciation,” Jeremy Porter, a lecturer in Columbia University’s health sciences department, said. “As sea level rise accelerates, we expect the corresponding loss in relative home value to accelerate as well. 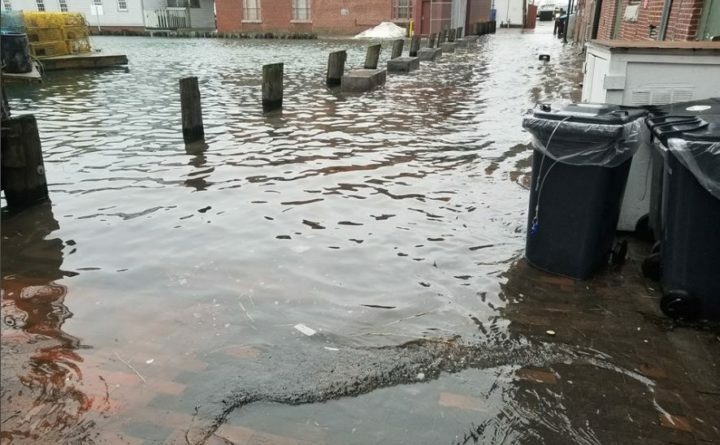 The U.S. Army Corps of Engineers expects a sea level rise across coastal New England of 1.7 inches in five years, 3.6 inches in 10 years and 5.6 inches in 15 years. 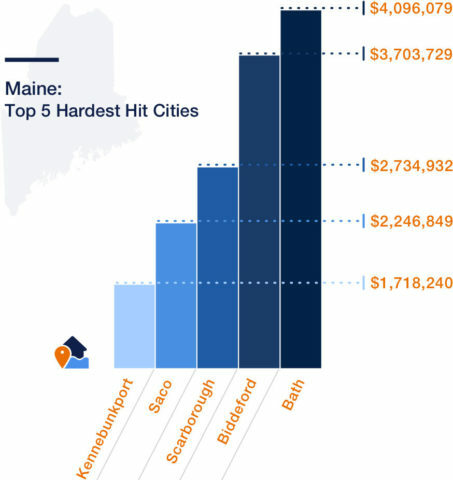 Bath tops the list of Maine cities with home prices hardest hit by flooding caused by sea level rise. Most cars are unable to drive in 6 inches or more of water. Even 6 inches of water can damage wooden floors, carpets, drywall, exposed insulation and insulated appliances. Areas susceptible to flooding in Maine are mostly coastal and include Kittery, York, Kennebunk, Saco, Rockland, Searsport, Biddeford, Falmouth, Bucksport, Winter Harbor and Southwest Harbor. Bath is the hardest hit city in the Pine Tree State, according to the researchers. Homes there lost $4.1 million in value between 2005 and 2017 because of tidal flooding caused by rising sea levels. If nothing is done to mitigate the impacts from sea level rise over the next 15 years, another $4.7 million in value could be lost. Bath was followed by Biddeford, with $3.7 million in losses between 2005 and 2017, then Scarborough with $2.7 million in losses, Saco with $2.2 million and Kennebunkport with $1.7 million. Scarborough and Bath had the top three individual homes that were hardest hit. A property on E. Grand Avenue in Scarborough that should be worth $248,556 now is valued at only $117,100 because of flooding issues. That’s $131,456 lower than it should be, the researchers said. A Varney Mill Road property in Bath worth $92,900 should be worth $150,674. And one on Washington Street in Bath assessed at $93,800 should be worth $146,898. Areas south and north of Portland incurred higher losses than the city itself. Affected properties in Portland already have lost $701,833 and stand to lost another $809,808 in the next 15 years if no mitigation efforts are taken. The Portland numbers include Peaks Island, Fort Levett, Long Island and Cliff Island. Of the 2.5 million properties analyzed by the researchers in New England, Massachusetts coastal homes were hit hardest. One triplex on Marginal Street in Boston currently valued at $373,725 would be worth more than double that, $799,054 if increased tidal flooding wasn’t bringing down its value. As sea levels rise, flooding that affects home values also will increase, a report by Columbia University and First Street Foundation found. 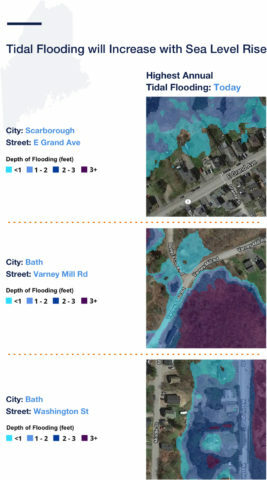 The graphic shows the three Maine homes whose property values were hardest hit and the flooding problems around them. Overall, Boston-area homes already lost $5.7 million and could lose another $6.6 million over the next 15 years if anti-flooding measures aren’t taken. By coastal state, Massachusetts lost the most value at at $273.4 million from 2005 to 2017, followed by Maine at $69.9 million, Rhode Island at $44.7 million and New Hampshire at $15.2 million. Property flooding isn’t the only factor weighing down home values. Flooding also can impede access to emergency services and community buildings including religious services, schools and medical visits. The research found that properties at high risk of flooding are more likely to be listed for sale each year as rising sea levels increase the tidal flooding risks. With the higher risk, fewer buyers are attracted to those homes, and the purchase price declines. There are steps homeowners can take to reduce their risk of flooding, including talking to their city or town to work on anti-flooding measures like seawalls, pumps and backflow preventers that keep overrun sewage from floating back into the city. The researchers said homeowners also can raise their houses, which is an expensive option. They also can raise expensive items around the home, including HVAC systems, plumbing and electric meters, said Matthew Eby, executive director of First Street. Homeowners also should make sure they have the right flood insurance. The researchers have established a database at FloodiQ.com where anyone can check the flood risk of their town or even their home or business address. The database can help average Americans who wants to invest in real estate, giving them the same information institutional investors and wealthy individuals have, Eby said. “Knowing the direct impact of previous flood events on the value of your home and understanding how the risks of flooding will increase as sea levels rise is something the public deserves to know,” he said.